De gevechten rond de Middelandse zee, 72 nieuwe figuren, veel tegels, en nieuwe scenario's. 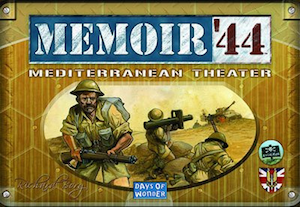 The Mediterranean Theater Expansion introduces British Army figures and rules to the Memoir '44 game system, as well as a whole new class of Special Weapon Assets to embed in infantry units. New miniatures include the British Infantry, 25- pounder guns and Crusader Tanks, plus 3 Anti-tank weapons. The Mediterranean Theater expansion includes 8 new historical scenarios in North Africa, 44 new doublesided Terrain tiles, new obstacles, markers and specialforces badges. Requires the original Memoir ’44 board game.